We were allowed one hop but no heel drops. Winner take all. I did however get one hell of a pirouette education as far as what worked and what didn’t. At least 3 of those boys went on to dance with ABT, NYC Ballet, Mexican National Ballet, you name it. I haven’t done so badly myself. My personal best was 11 pirouettes and I could always easily achieve 5 to 7 on stage depending on the conditions, and this was before we had video reference to help out. 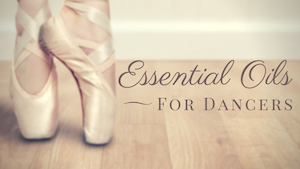 Here’s the deal: every dancer’s body is different, some are tall, some small, some have a nagging foot problem, some have 4 pounds of pony tail to contend with. What every dancer needs to find is what works for them and their particular body type/shape etc. there is not only one way to turn! Practice makes… The desire to practice more so I can get it right! Within the “confines” of the aesthetics and injury prevention aspects of technique we can discover tiny tricks, “cheats” if you will, to make our physical form get around 1, 2, maybe even 3 or 4 more times. My favorite “cheat” that I have been using for years is to add my extra turns at the beginning of my turn sequence instead of trying to squeeze them out at the end. 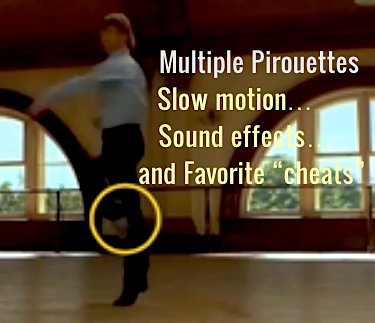 If you use enough force for 14 pirouettes at the very beginning of your turns, hit a static position for your turns and try to control that and make it look good, you will always look tight, muscle bound, awkward and you will almost invariably have to hop or adjust your supporting foot to accommodate that extra force. So #1, try and have a clear idea as to how many turns you are trying for. Let’s say it’s six for the sake of the lesson. Use enough force for six pirouettes (again this is where practice comes in handy) the average dancer can handle the physical stress of the force for six pirouettes without losing it. 3 plus 6 will always be 9. Odd concept, I know, but watch all the greats: Baryshnikov, Bujones, Acosta, Bolle, Gouneo. Down the line they all do the same thing, they don’t achieve their proper pirouette position until sometime in their fifth, sixth or seventh rotation. Finally, find what trick works for YOUR body type to finish cleanly and you’ve got something. A great training aid I’ve used for years is holding some kind of weight in your hands as you are turning (water bottle, soda can, baseball mitt etc.) it’s easier to feel the momentum and understand the difference between turning or spinning and actually pirouetting. The sound effect will change for you too: if you are spinning you’ll feel like its a ‘whzwhzwhz’ or ‘bipbipbip’ kind of feeling. When pirouetting in the true sense it feels more like a ‘FOOM FOOM FOOOM’ or ‘WHHOOSH WHOOSH WHOOSH’ . You’ll know it when you get it. Nathan Prevost Has been a dance professional for more than 35 years, teaching, choreographing, performing, producing and directing. Nathan has appeared in more than 30 films, numerous T.V. Shows, dozens of commercials and music videos, has danced with 5 ballet or contemporary companies and toured the world with Paula Abdul, Reba McIntyre and others. He is based in Hollywood Ca. And teaches at the legendary Hama Dance center. 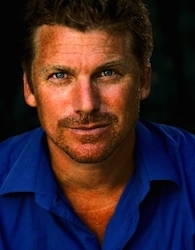 He is the owner of Dancesanity.com and was co-founder of Dancers’ Alliance, (dancersalliance.org) Nathan is also a certified golf teaching professional, cinematographer, set designer and builder, lighting designer, gaffer, steadicam operator and in his luckiest moments a husband to his beautiful wife Magda. Sorry to say, but you are really clueless when it comes to pirouettes in ballet. Simply raising your arms doesn’t create any additional inertia. Raising of the shoulder indicates a spot either too early or too late. You do not scoop and replace, you do not cork screw. The more I listen to your analysis the more it’s apparent you have no idea! Thanks for generously sharing your insights, Nathan. I liked the slo-mo and the diagramming and the rhythm of the whooshwhoosh- definitely helps. It’s always hard to get all the many movements aligned at the same time — appreciate your devotion to the art and sharing with all of us.